More than the reviews that I had read on this book, the title itself attracted me to read the book. I could not sustain my curiosity of getting to know what exactly is described in the book through those excellent reviews. In fact this book has been quoted as one of the must read books for this year. It is a very small book and is power packed with a lot of ideas for the world that is in constant change. It addresses the current world and the current state of minds when it comes to learning. The kind of exposure that we get in these internet advanced societies has transformed the whole culture of learning. While reading the book, I used to think about myself and compare it with my own ways of thinking and learning habits these days. And the kind of access I get with respect to the technology is unbelievable. I can read a lot more stuff by a click and even express my thoughts through my networks. Sharing has become easy too. It used to be so difficult a few years back to share something what I have newly learnt. Now it is just a click away! I feel I am always connected to my environment in one way or the other. 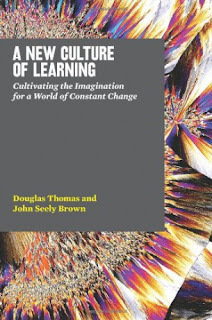 Douglas Thomas and Thomas Brown have beautifully captured the essence of what it means to learn and play in a world that is constantly changing. The book ends with a statement that effectively communicates the meaning of the book – “And where imaginations play, learning happens”. Here is a short excerpt from the 1st chapter of the book. When people think about learning, they usually think about schools. And when people think about schools, they usually think about teachers. In this book, we take a different approach. In our view, the kind of learning that will define the twenty-first century is not taking place in a classroom – at least not in today’s classroom. Rather, it is a happening all around us, everywhere, and it is powerful. We call this phenomenon the new culture of learning, and it is grounded in a very simple question: What happens to learning when we move from the stable infrastructure of the twentieth century to the fluid infrastructure of the twenty-first century, where technology is constantly creating and responding to change? Seriously, that is what most people still think. And we all are beginning to realize this phenomenon now because the growing networked infrastructure is amplifying our ability to access the unlimited resources. It is the combination of the information network around us and the structured environment making the new culture of learning so powerful. The book begins with a lot of good examples or stories. Those stories are focused on the kind of learning that is happening across all the age groups. Be it a school going kid or a grandmother sitting at home. They talk about how the current infrastructure is enabling them to learn things in a faster way and in a more efficient way. Learning through games and plays is one of such examples. Each of the stories illustrates how the new culture of learning is taking root and transforming the way we think about information, imagination and play. The authors argue that, for most of the twentieth century our educational system has been built on the assumption that teaching is necessary for learning to occur. Accordingly, education has been seen as a process of transferring information from a higher authority down to the student. And I completely agree with what they say. The old model just can’t keep up with the rapid rate of change in the twenty first century. We believe, learning should be viewed in terms of an environment-combined with rich resources provided by the information network and the context in which learning happens. Teachers, students and information are all being party to the environment and are all expected to grow. The book also highlights on the critical aspect of embracing the change. Embracing change means viewing the future as a set of new possibilities, rather than something that forces us to adjust. It is so hard to believe that we can be taught or trained to handle each new change on a case by case basis. One example I can quote is about the social networking. There are so many new things happening around and people are trying to learn day in and day out through their own ways. Who taught us to use Wikipedia, facebook or twitter to share, contribute and learn something from it? It was very interesting for me to learn about Wikipedia outperforming Britannica only because of making the change visible. And one more very important shift that is highlighted in the book is of how we think about our presence? As the authors address this as the ‘personal’ combined with the ‘collective’. The balance between the personal and the collective is the key. And the distinction between the collective and the community is also important to know. Authors assert that the communities can be passive but the collectives can’t. Their distinction in terms of learning is very much straightforward: “in communities, people learn in order to belong. In a collective, people belong in order to learn”. Blogging can be a better example here. I blog whenever I want to. It is my personal experience. And it is always subject to change and revision by others, the influence of collective can powerfully and meaningfully shape my views, just as a blogger, at the same time, can shape the collective. In the chapter - ‘We know more than we can say’ the authors highlight the difference between the explicit knowledge and the tacit knowledge. While the old culture used to focus almost on the explicit knowledge, the new culture has the ‘tacit learning’ as its core. The reason for the difference is that learning tacit knowledge happens not only in the brain but also in the body, through all our senses. It is an experiential process as well as a cognitive one. It is not about being taught knowledge; it is about absorbing it. We learn by inquiries and we learn by dwelling into something. Authors also highlights on the three dimensions of learning. They are - Knowing, Making and Playing. They say that they are already beginning to emerge and are happening if we just observe around. The same examples of what kids do today on social network and social media sites. In addition to all these some more tools that can help amplify the learning experience are by hanging out, messing around and geeking out. We see a lot of people following these tools these days and they will be in complete flow and the learning will be at it best when they are at it. In the end authors say - the new culture of learning is a culture of collective inquiry that harnesses the resources of network and transforms them into nutrients within the petri dish environment, turning it into a space of play and experimentation. Only when we care about experimentation, play and questions more than efficiency, outcomes and answers do we have a space that is truly open to the imagination. And there learning happens! It is a must read book for all of us to understand and explore the new ways of learning and connect ourselves to the environment around us. Perhaps, I wish all the educational institutions will embrace this new culture and create a world of possibilities. Your review is very instructive about the book. Your review gives the impression that the authors are fascinated by the technologies of learning. I may be wrong in drawing this conclusion. Knowledge that is easily accessible does not mean that people will access it and make the effort to learn. It is common place throughout the world to see people walk by some of the greatest libraries without ever using the storehouse of knowledge in it. Life-long learning is, in fact, nothing other than learning outside the classroom. What distinguishes an educated person from a literate person is the quality and quantity of learning he or she does outside the classroom. It is pathetic to see Ph.D.s from elite schools in America think and act as if they are educated. Such highly literate people are nothing more than semi-educated, at best. My "illiterate peasant" paternal grandmother Guruvamma had a simple saying: "If you already know, there is no need to learn. If you don't then you have to learn every day". She insisted that her children and grandchildren learn constantly. It is possible that her consciousness about why her family was defeated and became destitute had something to do with her laser like focus on learning. Maybe, the book you speak so highly of will encourage people to undertake life-long learning. In time it becomes second nature. A great civilization state such as India desperately needs people who are life-long learners. Thank you for bringing my attention to this book. Sounds like a interesting book. Looks like the attention towards play is leaning towards 'intellect' than the 'physical'. May be I am wrong. I think current day interpretation of 'teaching is necessary' is wrong. When you take out teaching is a 'job' from the context, that makes it meaningful. Its about how to learn/teach to learn, not reach an end of book or examination, imho.